Designers wanted to create a community that was equitable, affordable, and open-minded. But over the years developers began courting wealthy weekenders, and today units sell at stratospheric prices. SAN FRANCISCO — Three hours north of San Francisco, on a sparse and rugged stretch of coastline, lies an unexpected planned residential community. Designed and built starting in the early 1960s on a former sheep ranch, the Sea Ranch is unlike other post-war planned communities, such as suburban Levittown, Pennsylvania, or Irvine, New York. Firstly, the Sea Ranch is rural and more than 100 miles from San Francisco, the nearest city of significant size. 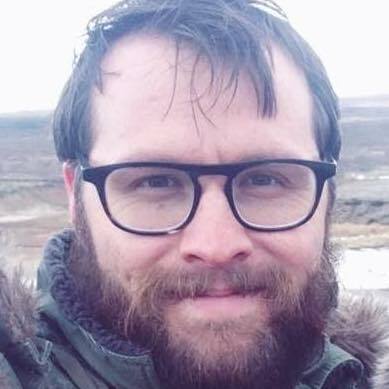 And secondly, the Sea Ranch was born out of a peculiar marriage of developer-driven interests and social and environmental awareness. 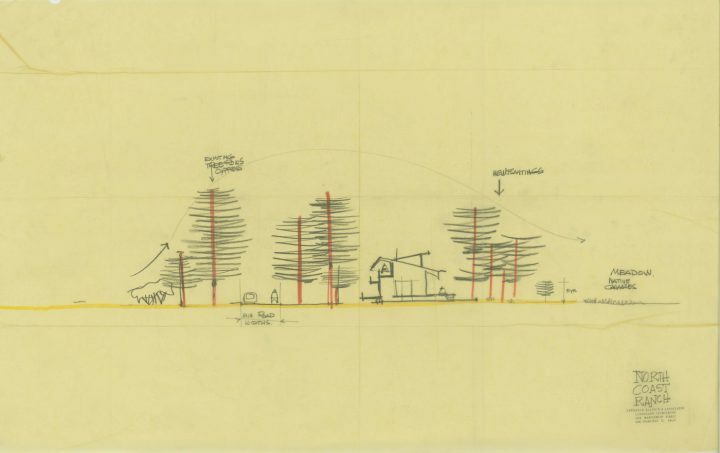 The early history of the Sea Ranch is on view at the San Francisco Museum of Modern Art (SFMOMA) in The Sea Ranch: Architecture, Environment, and Idealism. This community was decidedly not a commune, and its relationship to counterculture or utopianism was not foundational. The Sea Ranch was a profit-generating project of Castle & Cooke, a conglomerate that, in addition to real estate, owned Dole Food Company. How this development came to incorporate ideas of ecological sensitivity, affordability, and community rests on the planner Al Boeke and his landscape architect Lawrence Halprin. Halprin was deeply influenced by his time spent on a kibbutz in Israel, as well as the sense of social freedom he experienced after moving to California from the East Coast. 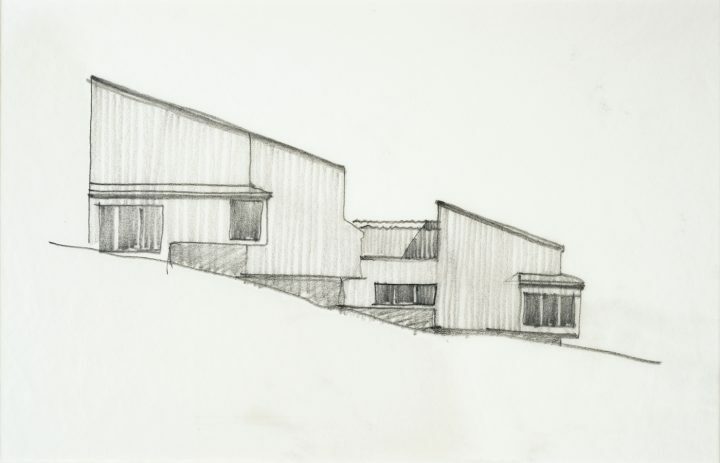 One of the most important design principles of the Sea Ranch was a light ecological footprint and a harmonious blending of architecture and landscape. The community’s master plan called for the preservation of meadows and restricting development on 50% of the land. Many of the initial structures were built alongside clusters of trees, which helped mitigate their presence. Exterior building materials were limited to unfinished redwood and cypress, which helped them further blend in with groves as well as mirror the local vernacular architecture. Flower beds, parked cars, and reflective surfaces were also restricted. Uniformity of design was key, but unlike in most suburbs, this uniformity took its cue from the landscape rather than imposing an alien visual language. 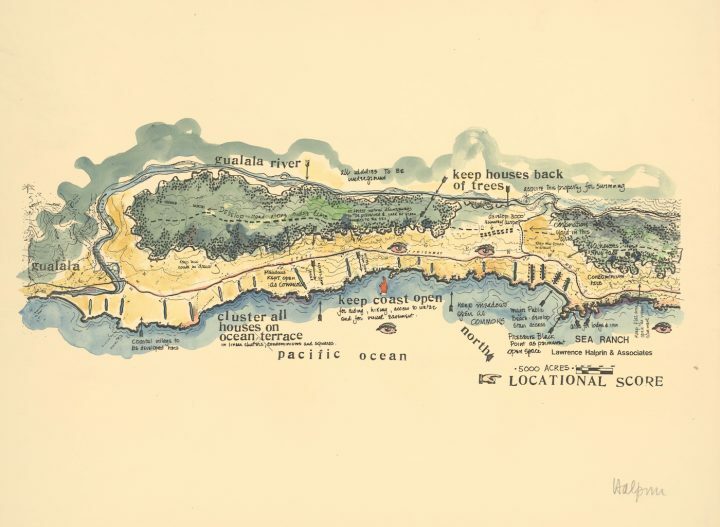 The exhibition focuses primarily on the early years of the Sea Ranch with a display of colorful design sketches, mid-century graphic design, and period photographs. This narrow time frame allows for the exhibition to linger on the idealism and ethos of the community’s planners. 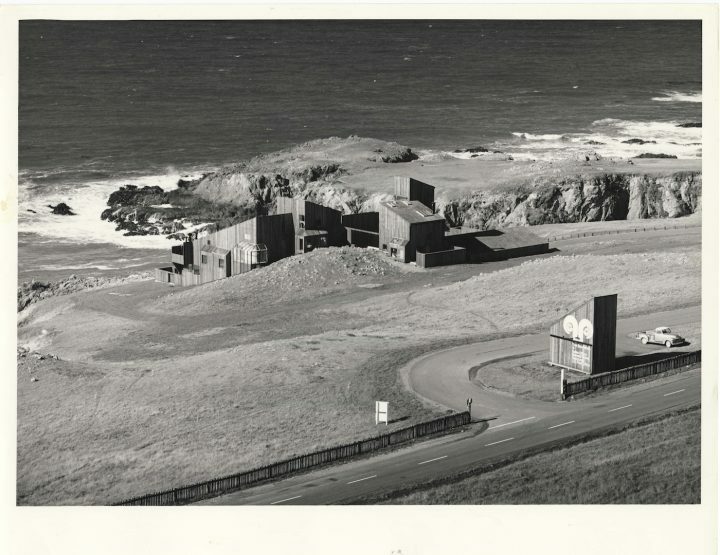 However, beginning in the 1970s, as the Sea Ranch began to grow, other locals grew increasingly concerned that the development would block their access to the beach. A 10-year construction moratorium was imposed while the conflict worked its way through legal and regulatory channels. Construction was allowed to resume in the early 1980s, and by 1988 all the available building sites — more than 2,000 — had been sold. The lengthy moratorium placed financial pressures on the developers who began courting wealthy weekenders to purchase preexisting buildings or sites available for new construction, to the detriment of the idealistic original intent of the community. This aspect of the Sea Ranch’s history is largely relegated to a few minutes in an information video, with a bit more detail provided in the exhibition catalogue. The Sea Ranch has become a popular place for vacationers and homeowners alike, and an active community association enforces the design guidelines that have made it famous. As of January 2019, an 808-square-foot unit is listed for sale for $579,000 — affordable only relative to California’s stratospheric real estate prices. Several properties are currently listed in excess of $2 million, placing them far out of reach for those seeking affordability. 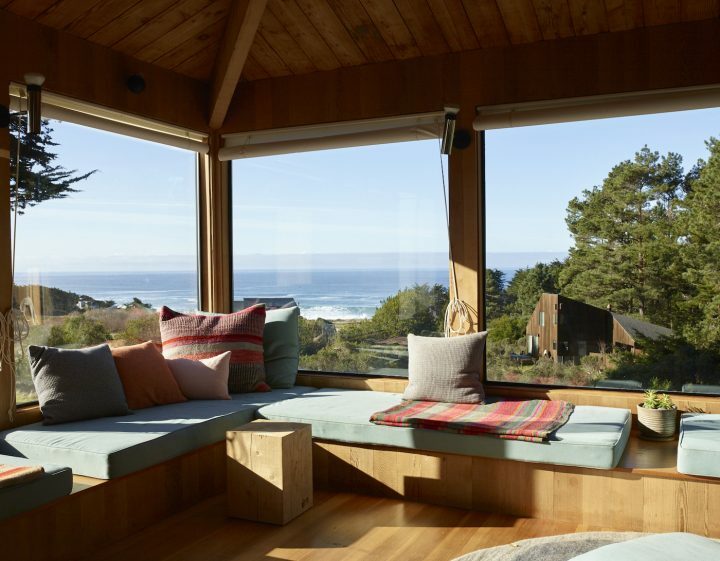 Many Sea Ranch homes are available on Airbnb, often through property management companies, suggesting a challenge to the idea of a permanent, well-connected community. Exhibition material states that the Sea Ranch is “a model for 21st-century progressive living,” but this question isn’t thoroughly investigated in the exhibition. Its founding principles are admirable, and architects and planners might have much to learn from its design. But is the Sea Ranch at risk of becoming a Potemkin Village of vacation rentals and second (or third) homes? How the community’s original ideals stand up to contemporary challenges is left as an open question. 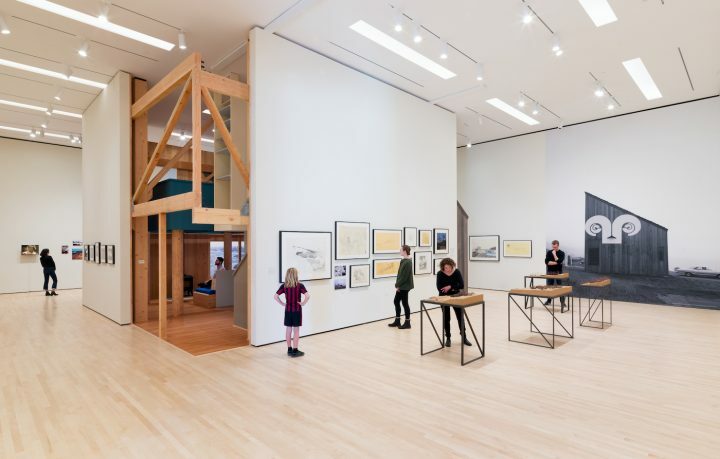 The Sea Ranch: Architecture, Environment, and Idealism continues at the San Francisco Museum of Modern Art (151 3rd St, San Francisco) through April 28. The exhibition is curated by Jennifer Dunlop Fletcher and Joseph Becker.